Scotsmen who have run in the Olympic Games are fewer in number than we might like; Scotsmen who have won medals in the Olympic Games are even fewer and further between. Understanding that, we should maybe be more familiar with those who have done so than we are. Among those in the second category is WR Seagrove who won two silver medals – one each in the Games of 1920 and 1924, and yet he is almost totally unknown even among those who consider themselves well versed in the sport. Given the difficulty in getting details of races for a man who raced almost entirely in University athletics in the 1920’s, what follows will be more career highlights with a look at the sport as it was then. Seagrove was born and brought up in London and educated at Highgate School which he left in 1917. Although he won SAAA championships at 880 yards and the Mile, and the AAA’s title in the Mile, he won his Olympic medals in the 3000m team race and was considered to be at his best over two miles. He also competed over the country and won the annual Oxford v Cambridge match. William Raymond Seagrove was born on 2nd July 1898. 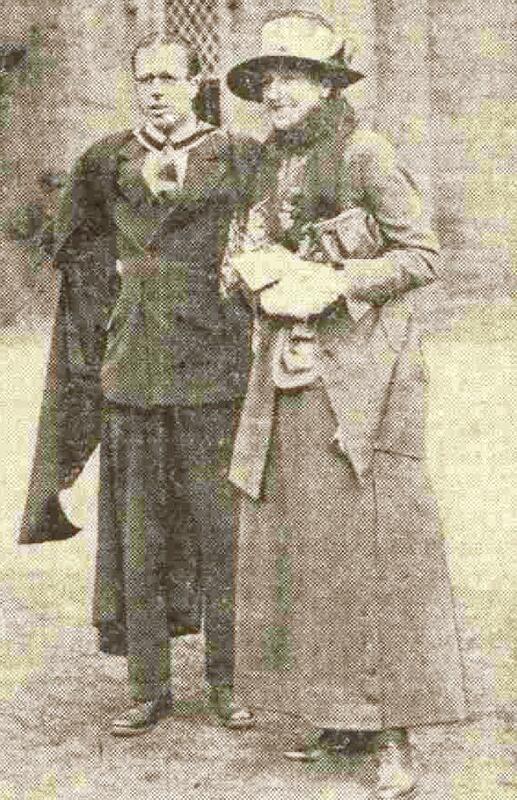 He was a promising athlete while at school and in 1916 won the 880 yards at the London Schools meeting. Leaving school in April 1917, he served in the Army as a lieutenant in the Worcestershire Regiment during World War 1. After demob he attended Clare College, Cambridge and his athletics flourished. Fifth in the AAA’s mile in 1920 but better known for his running over longer distances, he was selected for the 1920 Olympics in Antwerp as a member of the 3000m team. 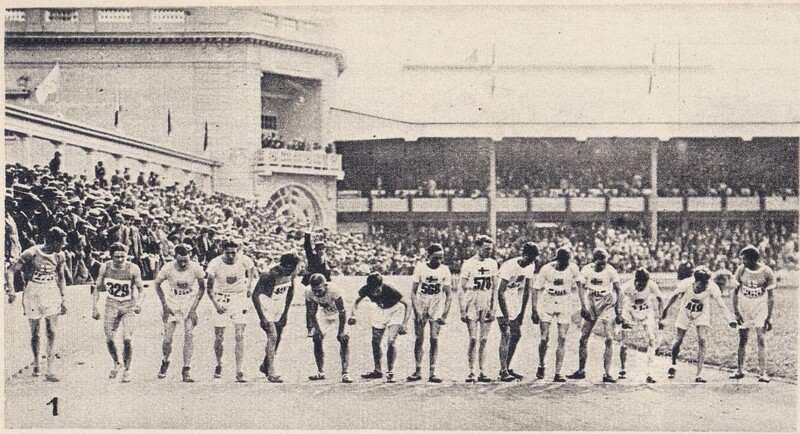 The Games were held in Belgium, in Antwerp, where he finished sixth and with team mates Albert Hill and Joe Blewitt he won silver for the team race. The race was held on Saturday 20th and Sunday 21st August. In the heats on Saturday, Britain won the first heat from Sweden and there were five GB runners forward including Duncan McPhee who was second. France won the second heat from the USA – only two teams finished this race. On Sunday in the final, Blewitt was fifth, Albert Hill was seventh, Seagrove was ninth and James Hatton was tenth. Duncan McPhee did not finish. With only the first three scoring, Seagrove won his medal. Sweden, France and Italy in that order made up the field in the team race. 1. J Guillemot (France) in 14:55.6, 2. Nurmi 15:00.0, 3. Eric Backman (Sweden) 15:13, 4. T Koskenniemi (Finland) 15:17, 5. Joe Blewitt (GB) 15:19; 6. W Seagrove 15:21.0, 7. C Speroni . There were 13 finishers. It is daunting to think of four Olympic races within seven days. 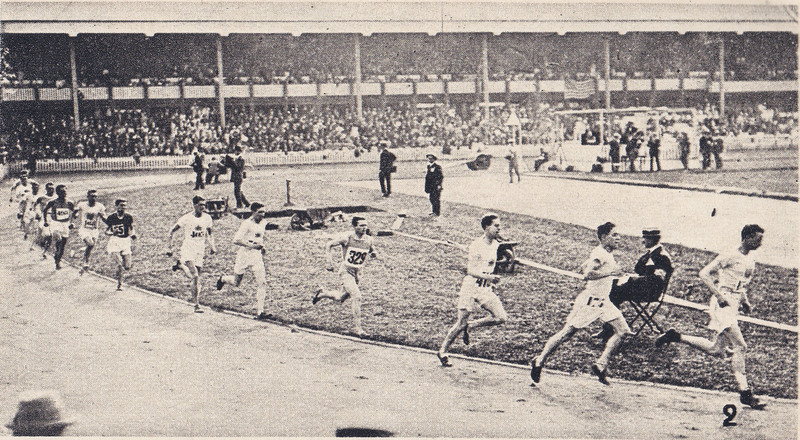 1920 Olympic 5000m final: Seagrove third from right. “On their return home, the Oxford captain (Evelyn Montague of Magdalen) raised the possibility of inviting the Cornell cross-country team to a race in England with his counterpart, William Seagrove of Clare. Seagrove put the proposal to his committee and the response was positive, although, as he pointed out to Montague, Cambridge “could not undertake any financial responsibility.” With an agreement in principle, the two captains wrote formally to Cornell to invite them to a race between a combined Oxbridge team. Later that summer, on receiving Cornell’s acceptance, the two set about finalising the arrangements. The original date had to be altered to allow the Americans time to get used to English cross-country courses – they differed substantially from those found in America. Water crossings and ploughed land were both a novelty. “Under splendid skies with the stars and stripes and the union jack fluttering in the breeze, a large gay crowd this afternoon at the Harvard Stadium witnessed the Yale and Harvard track representatives defeat the Oxford and Cambridge representatives in competitions in what is claimed to be a new world record and several other records at meets between combined university teams.” Despite the defeat it was a very good Achilles team with Bevil Rudd winning the quarter-mile and Hyla Stallard the Mile. 1924 was probably Seagrove’s best year. He won the SAAA mile on 14th June defeating young Tom Riddell in 4:29.6. “The Glenalmond master and old Cantab’ won by eight yards. In the AAA’s at the White City one week later he won the Mile by only three yards in 4:21.2 from HA Johnston of Herne Hill AC while Hyla Stallard ran in, and won, the 880 yards in 1:54.6. Since it was Olympic year, there was no Triangular International between Scotland, Ireland and England but, no matter, Seagrove was bound for Paris where 44 nations competed against each other. In the Olympics of 1924, Seagrove ran in only one event – the 3000m team race. The heats were on Friday, 11th July and the final on Sunday, 13th. Seagrove (9th) was fourth Briton in the heats behind Walter Porter (3rd), Herbert Johnston (5th) and Bertram MacDonald (6th). The Finnish team of Nurmi, Ritola and Tala was first in their heat with their men in first, second and third. The final was won by Finland with their counting runners being Nurmi first, Ritola second and Katz fifth. The British runners were MacDonald third, Johnston fourth, George Webber seventh, Porter tenth, Arthur Clark eleventh and Seagrove sixteenth. If Nurmi was the athlete of the Games, Eric Liddell with his 400m victory and 200m bronze was not far behind. 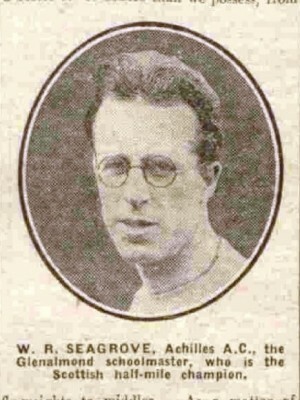 Having graduated from University, Seagrove was a master at Glenalmond School in Perthshire where he no doubt encouraged the sport of athletics – it is known that there were matches between the Atalanta Club (made up of students from the four ancient Scottish Universities) and Glenalmond with the older runners making generous allowances to the schoolboys. He was not finished with serious competition yet though and in June 1926 he won the SAAA half mile championship. He won by three yards from Tom Riddell in 1:58.2 which was a new championship best time. He also competed in the Mile where he was noted among the ‘also ran’ contingent. This time there was a triangular international where Seagrove finished second to CR Griffiths of England in the half mile. Leaving Glenalmond to found a prep school in Seaford in Sussex where he was headmaster and mathematics master. Interestingly enough he competed for the Scottish universities Atalanta Club on 11th July, 1927, against English Universities other than Oxford and Cambridge. He is reported to have run as Achilles in the half mile but the report states that he was running for Atalanta. In addition he ran the first stage of the medley relay (the half mile leg) for Atalanta. Like many university men of his day, he stopped running fairly suddenly and led a varied life thereafter. He ran the Normansal School choir, introduced boys to opera and organised annual visits to the Vienna Boys Choir concerts in Brighton. He was master of ceremonies and umpire at the annual sports day: eight-year-olds competed in pole vault, long jump, shot as well as the usual events. Long distance running was encouraged. The connection with his old University was maintained and in 1938 he had the honour of giving the speech at the Annual Dinner of the Achilles Club. It is clear from the above that the world of athletics as experienced by Seagrove was vastly different from that of many athletes of the time and almost totally unrecognisable to modern athletes. He himself was also an accomplished pianist and violinist. He died on 5th June, 1980 in Seaford, Sussex at the age of 81.